No Power plus . . . a 40ft. Cherry Tree on our Roof! Less than 2 months ago, a major insurance claim was settled from last winter storm damage which included all new roofing, guttering, copper facing, etc. on our 300-year old house. We feel your pain, Pattye. Who would have thought we’d have snow instead of a world series in October??!!! Perhaps all this talk of honesty and decency is coming home to roost on us all. This is the 6th major “atypical” storm this year…CLIMATE CHANGE. WHY are we so preoccupied with contracts and taxes — and put so little energy and effort into the very world we live in. Sorry to hear about your damage. Leaves and snow seem to be a combination few trees survived. So sorry to see that, Pattye. 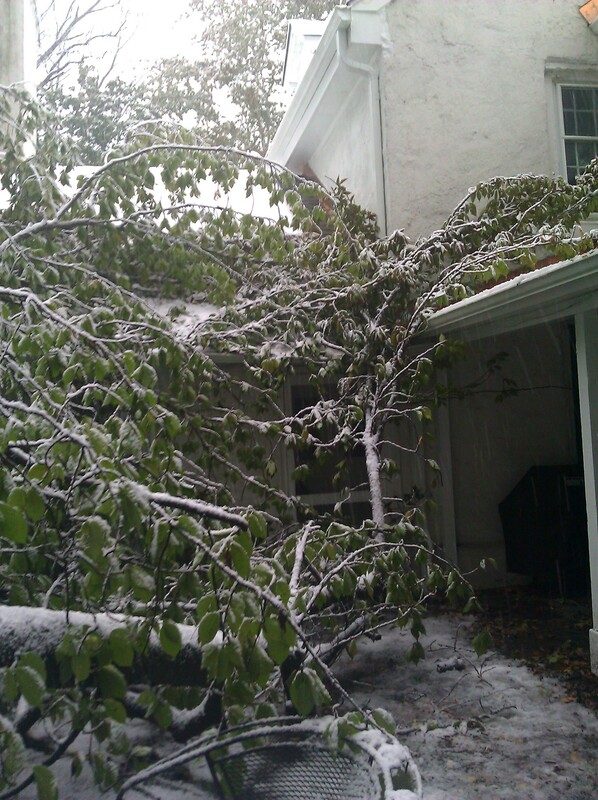 I hope that your new roof was sturdy enough to bear the limbs. If you need any chain saw help, let me know. I did just see that a new study by a previous global warming skeptic – partially funded by the Koch brothers, of all people – has confirmed that the land is indeed 1.6 degrees F warmer now than it was in the 50s. You can’t escape the science! Causes and solution remain unresolved, of course, but the study author did acknowledge that “it makes sense to reduce the carbon dioxide created by fossil fuels”. Good point Ray — this is a case where the scientists are telling us things, but the politicians find it politically inconvenient to accept it. Kind of like the revenues around here — the economy is telling us something and we find the solutions politically inconvenient. Again — Don Clarke was a long time board member who made the buffalo run on a nickel — and he said “cost causers pay” ….. meaning the people who benefit the most directly from an expenditure should have a bigger stake in it. Student Activity Fee — tuition — could take a huge bite out of this problem. Does ANYONE have the nerve to point out that the Emperor is truly naked? And bring some clothes? Don’t just scare voters — solve problems. BOTH SIDES — EITHER SIDE? Just under 48 hours without power and my life changes….we are not an independent society — we need each other. So how can we help?